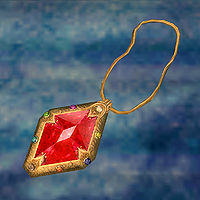 The Amulet of Kings is a pendant initially worn by Uriel Septim VII. After his assassination, you must deliver it to the Grandmaster of the Blades. After escorting Martin, Uriel's illegitimate son, back to Grandmaster Jauffre, the Amulet is stolen by the Mythic Dawn. You are forced to enter the Paradise of Mankar Camoran in order to recover it. This achieved, preparations are made for Martin's coronation, but the ceremony is interrupted by a Daedric assault on the capital. After fighting his way to the Temple of the One, Martin is forced to smash the amulet, this being the only way to defeat Mehrunes Dagon. The power of Martin's blood summons a rare Aedric avatar in the form of Akatosh, a fiery dragon. Dagon is defeated, but the nearly four thousand year history of the Amulet of Kings is ended. Attempting to equip the Amulet of Kings will result in the following message: "The Amulet of Kings slips off as you try to fasten it around your neck." On the PC, you can obtain an equippable version of the amulet by using console commands. If you don't have the amulet, type: player.additem 000250A0 1. Once you have it, type: player.equipitem 000250A0 1. If you have the amulet, you can also use: player.createfullactorcopy, then click on your clone and type: kill (or kill it normally) to obtain an equippable version of the amulet. The Amulet of Kings can be equipped by any NPC, since the Amulet's script only checks if you are trying to equip it.